Two of the MLS’ best teams squared off in Washington D.C. on Saturday, with Los Angeles FC and DC United going toe-to-toe, but the match didn’t exactly deliver on expectations, as it was fairly one-sided. https://omegatipsters.com/betting-tips/football/1×2 had predicted that the match would be a close one and slightly favored Los Angeles FC. Star striker Carlos Vela was a thorn in United’s side throughout the game, especially in the first half. He was presented with a huge opportunity from the get-go, just 10 minutes into the match, when a ball was served into the box, and Leonardo Jara elected to slide with his hand out, in an effort to block a ball that was headed for the penalty area. A penalty was awarded for the hand ball, which Vela took. Goalkeeper Bill Hamid came up big, though, guessing left, and coming up with a huge save, keeping his team in the game. But Vela would get his revenge just a few minutes later. A poor turnover by United’s defense allowed Vela to get one-on-one near the top of the box, and one of the best players in the MLS was given too much space with the ball at his feet. That allowed him to cut the ball back and bury a shot into the corner of the net in the 15th minute. And LAFC just kept coming, even after scoring. Vela found himself on the end of a beautiful long ball, and he then crafted a perfect through-ball to Diego Rossi, hitting him in stride. Rossi buried the ball in the back of the net in the 27th minute, and the match began to get out of hand. But there was more. Rossi found himself in behind the defense once again, this time on the other end of a ball from Mark-Anthony Kaye. He elected to finish it a different way this time — electing to chip the ball into the corner of the net with finesse, rather than powering it in. Regardless, it worked, and LAFC built a 3-0 lead in the 32nd minute, which was the score at halftime. United, to their credit, had some chances, but the passing in the final third just wasn’t there. A few combinations showed promise, but the final touch fell short, and it seldom led to a shot on goal — of which they could only muster one in the first 45 minutes. The run of play didn’t get any better in the second half, as a frustrated Wayne Rooney came sliding in with his cleats out, foot up, earning him a red card in the 50th minute of the match. His ejection seemed to fire up United, as the team played with a lot of urgency and passion in the minutes that followed. Unfortunately, being down a man against an elite squad proved difficult, and Rossi earned a hat trick with a 76th-minute goal. The one positive spin for United was that its fans were out in full force, as 20,600 supporters elected to attend the match, rather than view the cherry blossoms. 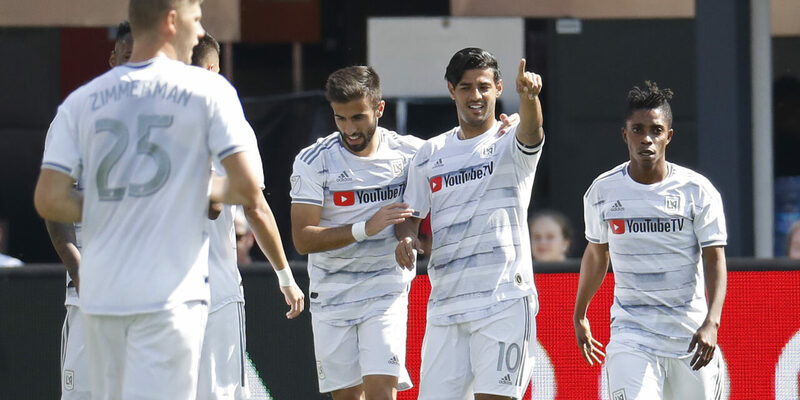 But the high pressure from LAFC, as well as their speed and pinpoint passing, proved to be too much for United’s defense to handle, and the offense was simply out of sync. Still, United boasts a 3-1-1 record, and they have a great opportunity to rebound against the Montreal Impact next week.